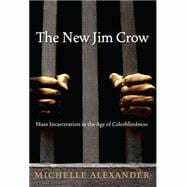 In a bold and innovative argument, a rising legal star shows readers how the mass incarceration of a disproportionate number of black men amounts to a devastating system of racial control. This is a terrifying reality that exists in the UK as much as in the US. Despite the triumphant dismantling of the Jim Crow laws, the system that once forced African-Americans into a segregated second-class citizenship still haunts and the criminal justice system still unfairly targets black men and deprives an entire segment of the population of their basic rights.